I am slowly working my way through the exercises in my new book, Art Before Breakfast – the workbook. I keep it on my kitchen counter and start each day by filling in a few pages. It’s a nice, gentle creative experience that’s reviving my drawing habit and I thought I’d record the experience as I go along — and share it with you. This isn’t meant to be a commercial, just a sort of visual process journal shot and edited on my phone. If you are working through the book too and would like to share any thoughts or discoveries, I’d love to hear about ’em. Previous Post What happened in the Studio. My workbook just arrived this week (yay!). I’m heading out of town for a few days, and it (along with a pen) are in my tote and I’m excited to get started. More excited about the drawing than the trip, actually. :0 Thank you for making this available in workbook form – it will be well-loved and well-used, and I will try my best to make it a monkey-free zone. Cheers! Hi Danny! Good to see you posting again! I enjoyed watching this and although I do have a daily habit, I think I will get your book just to work in it and “hang out” with you. 1) Do you edit your own videos? 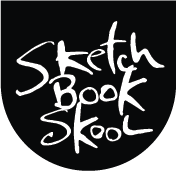 2) Can we take things a little more than a sketch outing and do our own “symposium” in NYC with SBS students and teachers? Great video, I’m working on those pages now…though I skipped the first one. Maybe I’ll have the courage to give it another go. The book is great. The video inspiration is a great motivator… Another way you have inspired me to make art part of my daily life. Because of your ideas and sketchbook skool, I have been doing something “arty” every day for almost 2 years now. This will give me another, different push to continue that habit. This video was fun to watch and gave me the motivation/reminder to go and order your workbook NOW. It should arrive in a week or so. Left on my own I’d probably be stuck with the same theme or just procrastinate till I have “the perfect plan” so it will be a great project !